The manga based on the series, written and illustrated by series character designer Yoshiyuki Sadamoto, has been serialized in Shonen Ace since 1995. The serialized and volumized editions are both published by Kadokawa Shoten. 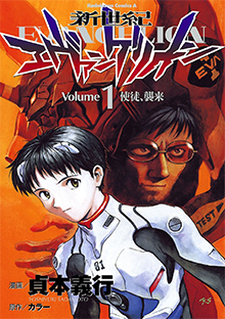 The manga exists as a separate entity from the anime, and features a number of distinct differences (examples: Shinji's eyes are brown instead of blue; Shinji and Rei's relationship is strengthened more; not all of the Angels that were in the anime appear in the manga). Drawing from the original story outline, the completed anime series, as well as his own artistic freedom, Sadamoto has portrayed an account of the story that has both distinct convergence and divergence with the anime version.